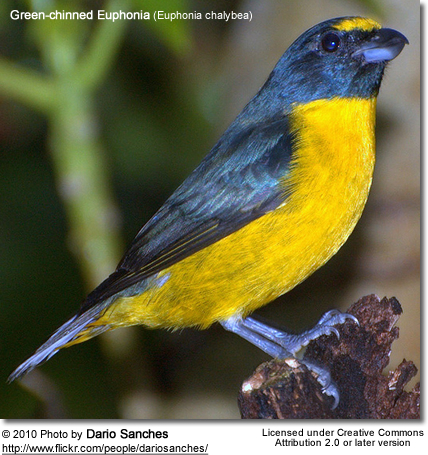 The Green-chinned Euphonias (Euphonia chalybea) - also known as Green-throated Euphonias - are central South American finches that occur naturally in eastern Brazil (from Río de Janeiro south to central Rio Grande do Sul) and adjacent eastern Paraguay (recently in Canindeyú, Alto Paraná, Caazapá and Itapuá, with historical records from Amambay) and northeastern Argentina (Misiones and Corrientes). They inhabit Atlantic Rain Forests, woodlands and forest edges. This species is at risk of becoming extinct due to habitat destruction within its limited range. It is, therefore, listed as "Near Threatened." The male's plumage is glossy black above with a greenish hue. The crown and the plumage below is yellow. The female is olive above and grey below with yellow-olive on the chin and flanks. 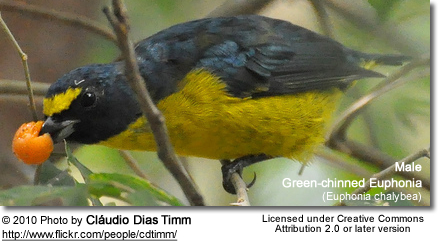 The Green-chinned Euphonia resembles the Violaceous Euphonia - but has a smaller yellow patch on the forecrown. Their diet consists of a variety of tree-borne fruits. They feed on fruit and insects. This small band of Green-chinned Euphonia was feeding on a guava (goiaba) tree Psidium guajava. In particular, they are known to feed on mistletoe berries. Their gut is specially adapted for mistletoe berries, which are poisonous.